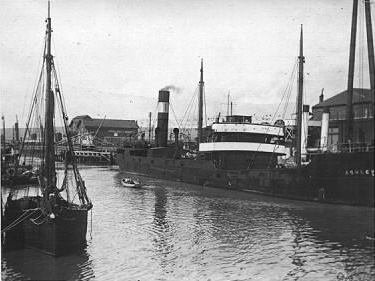 The S.S. Ashley just below Newhaven swing bridge. Note "Sheer legs" (crane) on the right, cut down in the early 1960s. The Marine Workshop building behind the Sheerlegs was used to overhaul marine engines etc., lifted out using the sheerlegs. Conversion into a trendy wine bar and roof-top restaurant didn't happen. The building has been partly encased by a new structure, and is now a college.